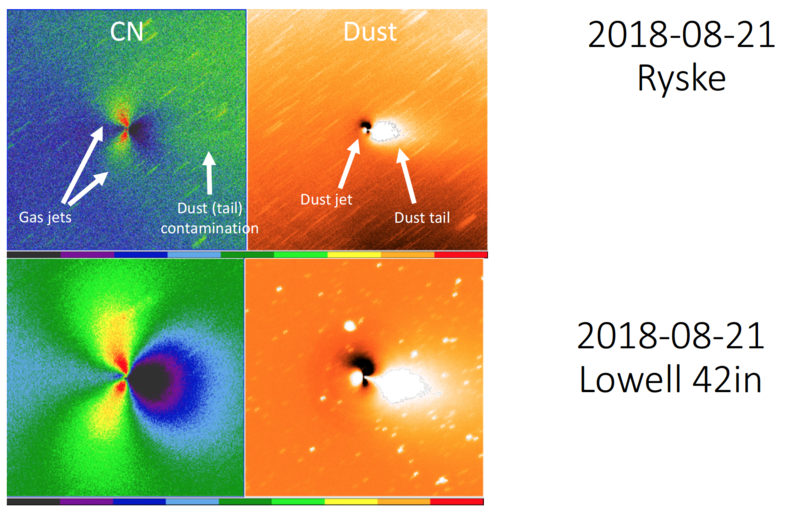 Recent observations performed by Jorma Ryske, using a brighter comet and larger telescope than in our tests, show detections of CN in comet 21P/G-Z. This is promising for comet Wirtanen around close approach. For more information, see the Semrock Filter updates section below. As described in the coma morphology page, images obtained with the cyanogen (CN) filter often exhibit very striking features in the coma. One reason for the success of these images is that CN has two strong emission bands at 387 nm and narrowband filters can be used to isolate these bands, producing high-contrast images of the gas. As the value of the CN filter became known, we started getting requests, both from professional and amateur astronomers, to find out where they could obtain a CN filter. Unfortunately, the narrowband filters that are currently used by most astronomers (designated HB filters) were produced in 1996 in anticipation of the apparition of comet Hale-Bopp, and are not readily available to observers that don't already have a set. Furthermore, the customized HB filters were expensive and complicated to make, and nobody has stepped forth to lead an effort to produce a new batch. Given the widespread desire for CN filters among the community, and the upcoming apparition of comet Wirtanen, we made an effort to look for a relatively inexpensive, off-the-shelf filter that might act as a proxy to the HB CN filters currently in use. After investigating a number of potential candidates, we concluded that our best option was a narrowband filter produced by Semrock, Inc., #FF01-387/11-25 (Specifications). This filter is available in several different sizes, some of which are compatible with amateur level telescopes, and range from $300 to $500 each. The bandpass is centered at 387 nm, has a high-transmission (90%), and a flat-topped profile. Although the Semrock bandpass is slightly wider (FWHM ~15 nm) than that in the HB CN filter, and has some small red leaks around 950-1000 nm, it was the best match that we encountered in our search of telescope-compatible filters. To investigate whether this Semrock filter would be practical for the amateur community, we purchased a 25 mm filter and performed a number of observational tests to evaluate its capabilities. We provide here a brief description of the tests and the results that were found. We scanned the transmission profile of the filter, and confirmed that it was within the uncertainties as advertised in the product specifications. Scan of the Semrock transmission profile (black line). 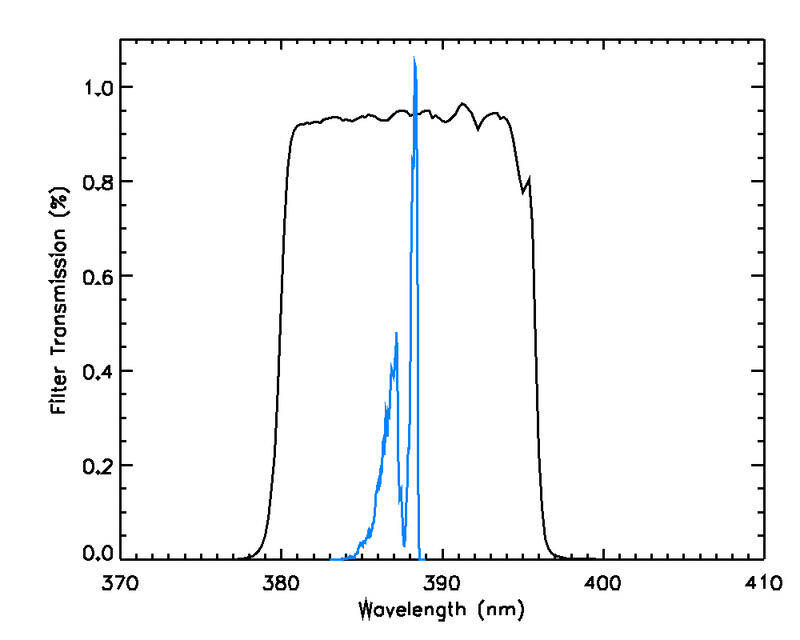 CN emission bands have been added (blue line) to show that all bands are captured by the filter. To test the observational capabilities of the filter, we wanted to use facilities representative of those to which an average amateur astronomer might have access. To this end, our tests were led by Elizabeth Warner (the organizer for the Wirtanen Campaign's Amateur Observers Program) at the University of Maryland observatory in College Park. This site is near Washington DC and has a relatively bright sky, but observations with narrowband filters are less affected by the sky background, so this should not be a significant factor in these tests. 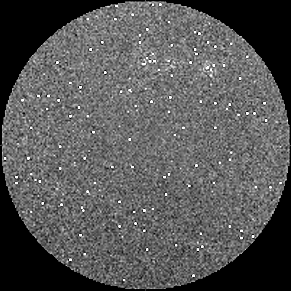 Tests were performed with a 7-inch telescope, fitted with an SBIG ST-7E Dual CCD camera, producing images with a pixel scale of 1.6 arcsec. The filter transmission and CCD QE at 387 nm are ~93% and 45%, respectively, giving a good throughput of the bright CN lines. At long wavelengths, the filter transmission and CCD QE at 1000 nm are both ~5%, which should limit the amount of contaminating signal that comes through the red leak. The 5 mm thickness of the filter prevents us from stacking a second blocking filter that would eliminate the red leak, so we also wanted to evaluate whether the red leak posed any problems with our observations. We obtained our test filter in early 2017 so we could observe the bright comets 45P/H-M-P and 41P/T-G-K. We intended to compare our images with observations obtained at the Discovery Channel Telescope to evaluate the results, but weather and other circumstances prevented us from getting contemporaneous observations with both telsecopes. On 5 Apr 2017, we were able to obtain images of the moon, a number of stars, and comet 41P with the Semrock filter, and we have DCT observations that bracket this date, providing a means of comparison. The Semrock filter was not parfocal with the other broadband filters typically used at the UMD observatory, so the telescope needed to be refocussed whenever we switched to/from the CN filter. (A telescope with an autofocus mechanism would minimize this problem). Test images of stars quickly made it obvious that the filter produced strong, extended halos around the stars that are not seen with our other filters. The halo appears as a skirt with values >10% of the peak extending out from the center, cutting off fairly abruptly between ~15-20 pixels. The halos suggest that the filter is not constructed with high-quality optical glass. The skirt also complicates the focusing process, because light is redistributed into the halo, making it difficult to define the "best" focus. After experimenting, we found that focusing on the terminator of the moon provided a better technique, because we could use the sharpness of the craters to better define a good focus for extended objects. We will note that, because the majority of the PSF is concentrated into the central peak, the halos are not a reason to reject the filter outright. For extended objects (e.g., cometary comae) the primary effect of the halo will be to smear out any structure that might be seen, which reduces sensitivity to low-contrast features. However, because of the existence and shape of the halo, the potential effects introduced by the PSF should be carefully considered when analyzing or interpreting any structures detected in the coma (e.g., is the skirt around a bright central peak being interpreted as arcs in the coma?). Thus, we urge extreme caution regarding any morphology in the observed comae with the Semrock filter. 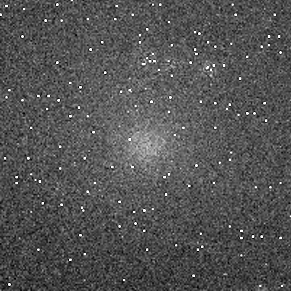 To test the Semrock filter for its ability to reveal CN morphology, we obtained a number of test images of comet 41P, which was 7th mag at the time. 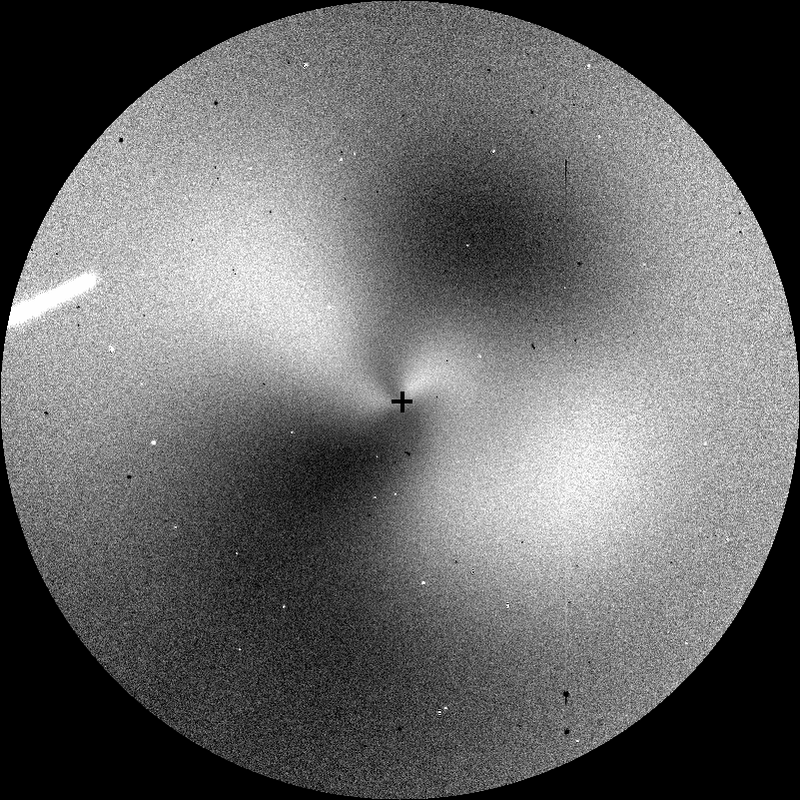 Although we were not able to get contemporaneous observations, we have DCT images, in the weeks before and after our tests, that show two well-defined spiral arcs (e.g., CBET 4375 & 4377). Given the fact that the DCT measurements bracket our tests, we expect that the features also existed at the time of our UMD observations. The comet was visible in 300 s images with the CN filter, exhibiting a broad, diffuse coma. The count level was low, with center of the coma ~10 DN above background, and no structure was obvious to the eye. We then combined three shifted and registered images to improve the S/N. 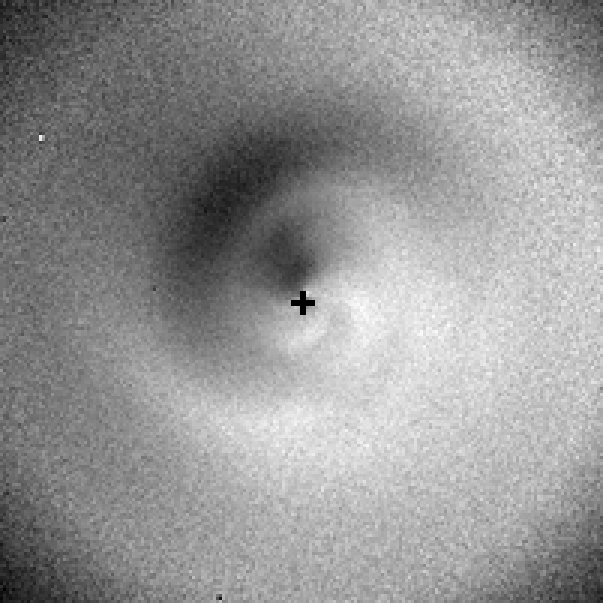 Two techniques were used: coadding the images to produce a 900 s image, and combining them using a resistant mean to produce an averaged image while eliminating bad pixels and cosmic rays. The S/N is better in the combined image, but there is still no evidence of structure. Even dividing out an azimuthally averaged profile to enhance the contrast of any features still reveals no deviation from a circularly symmetric coma. (The DCT images bracketing the UMD images revealed two well-defined jets in 180 s exposures.) This indicates that even 15 minute exposures with a small telescope could not capture enough signal to reveal the morphology in the relatively bright comet 41P/T-G-K. Although the total count level is low, the lack of any obvious central condensation in the CN coma indicates that the image is indeed dominated by the signal from CN, with little contribution from the underlying dust (which would be more concentrated around the nucleus). This suggests that 1) the dust continuum under the CN is small, and 2) the red leak is not producing much signal, and thus is not a problem, at least for 41P. Our basic conclusion from these tests is that for small telescopes with typical CCD cameras, the Semrock filter does not produce enough signal in reasonable exposure times to reveal CN structures, even in a brighter-than-normal comet. Thus, for the average observer, we can't recommend this filter as a means of monitoring the CN coma. 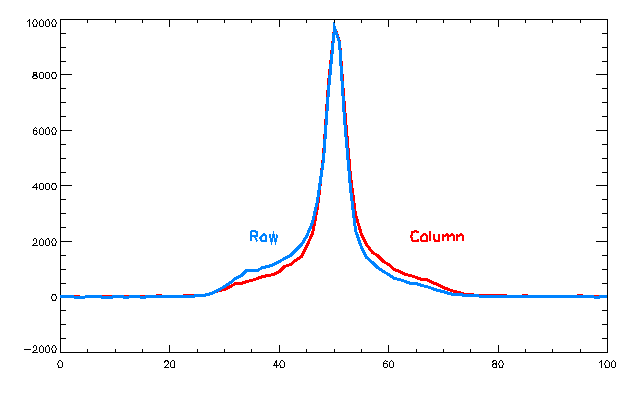 Furthermore, given that the bandpass of the filter is >90%, the CCD response is near 45%, and the filter captures the entirity of the CN bands, the primary reason for the inability to resolve features is that the light collecting area of the telescope is too small to produce the necessary S/N. Thus other narrowband CN filters will have the same limitations. Our conclusions are based on tests under the specific circumstances described above. It is also true that some observers have larger telescopes, blue-sensitive CCDs, and darker skies, and comet Wirtanen is predicted the be at least an order of magnitude brighter than 41P. These issues conspire to improve the S/N of the CN images, possibly to the point that features might become distinguishable. Thus, the Semrock filter could be of value to some segments of the amateur community, at least for a few rare and bright comets (though our cautions about the PSF issues are still warrented). Unfortunately, we cannot currently comment on what combination of observing facilities would be needed for the Semrock filter to show features. We are likely to perform some additional tests with larger telescopes (14-inch) as comet Wirtanen gets brighter, and will report on these as we have new information. Jorma Ryske used his own Semrock 387 nm filter to observe comet 21P/Giacobini-Zinner from the Taivaanvahti/Sky Guard observatory in Finland. His images clearly show CN and when enhanced, exhibit coma features. Jorma observed comet 21P/G-Z in late August/early September, when the comet was ~7th mag. He used a 12-inch telescope with a QSI 690 CCD (QE ~60% at 387 nm) and submitted his images to the 4*P Campaign website. Matthew Knight evaluated the images and compared them to sequences that he had obtained at Lowell Observatory with HB CN filters on the same nights. Comparisons are shown here. Comparison of images obtained by Jorma Ryske on 21 and 31 Aug 2018 with the Semrock 387 nm filter, to those obtained at Lowell observatory with an HB CN filter. Images have a common orientation (N up, E left), but have not been ajdusted to the same spatial scale. Jorma's CN images consist of 30 45 sec frames (22.5 min total exposure time) registered and coadded. All images have been enhanced by dividing out an azimuthal median profile. These comparisons are favorable, with all CN images exhibiting similar jet structures. This is promising for the Wirtanen close approach, especially if you have a larger telescope than we used for our tests. 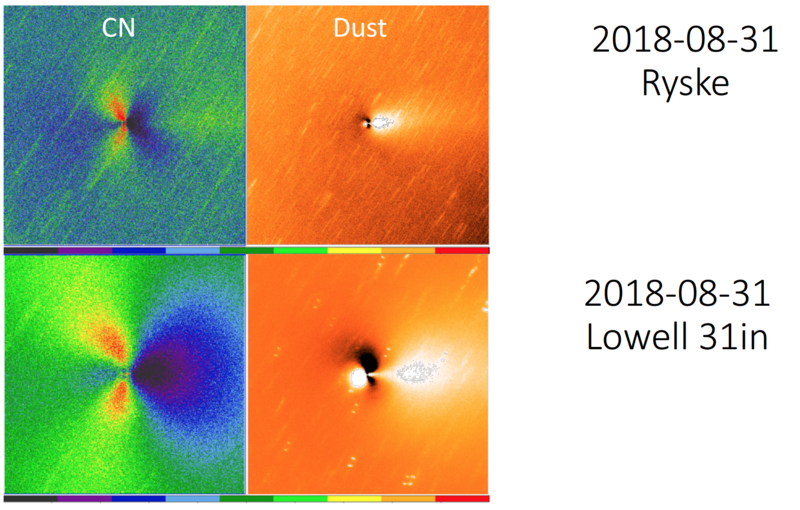 Comparison to the corresponding dust frames shows that there is more continuum contamination in the Semrock images than in the HB filter images, due to either the broader bandpass or the red leak, but it is a relatively minor issue for this comet and would not affect the measurements of the CN morphology. Given that 21P/G-Z was about the same brightness as 41P/T-G/K was in our observations, why is Jorma seeing features more distinctly than we saw in our tests? 1. Larger telescope: Jorma used a 12-inch telescope, compared to our 7-inch telescope, giving a light collecting area 3 times larger. 2. Higher CCD sensitivity: The QSI 690 has a ~60% QE compared to ~45% for our SBIG, providing a ~30% improvement. 3. Longer exposures: The 22.5 min coadds obtained by Jorma are 50% longer than the 15 min coadds that we obtained. 4. Higher CN production: Based on measurements obtained by Emmanuel Jehin, 21P/G-Z had a CN production of 3.8e25 molecules/s in mid September, while 41P/T-G-K had a CN production 5.1e24 molecules/s during our observations. Even with differences in geocentric distance and other factors affecting the ratio of these rates, the CN signal is likely to be 3-5 times higher in 21P than in 41P, providing more light for the detection. These factors combine to increase the signal in 21P by a factor of 15-30 over our 41P measurements, dramatically improving the ability to detect the CN features. We note that 46P is predicted to have a peak CN production ~2.5e25 molecules/s (A'Hearn et al. 1995, Farnham et al. 1998) which is closer to the 21P rates than to the 41P. The tests performed by Jorma provide good news with respect to the Semrock filter. With a larger telescope, longer exposures and high CN production rates, the filter has been demonstrated to be capable of recording CN features in a bright comet. In the words of Jorma Ryske: "This Semrock 387 nm filter really has challenges in it's usage, but seems that optimizing carefully optical components, exposure times, calibration images, tracking parameters and image processing it can perhaps provide valuable coma morphology results." Unfortunately, we don't know the threshold for the minimum telescope size that would be able to detect the CN features under similar circumstances. We also don't know how the gas will be distributed in the coma, or how the close proximity will affect the features. Given the S/N of the Jorma data, we expect that a 10-inch telescope with the same setup would likely be able to detect the CN features in comet Wirtanen, but smaller telescopes might be marginal. Fortunately, with Wirtanen up for many hours during the night, it's possible that enough images could be coadded to produce usable observations even in these smaller telescopes. So to modify our conclusions above, we can recommend the Semrock filter for observing comet Wirtanen with larger telescopes (>10-inch), as long as they have a blue-sensitive CCD. For smaller telescopes, our recommendation would be more marginal, and would depend on the users finances, ability to observe for long periods, risk threshold (are you willing to take a chance? ), etc.